AAA Brazilian Emerald (Mrq), AAA African Ruby Reversable Heart Pendant with Chain in 14K Gold Overlay Sterling Silver 11.450 Ct.
Kagem Zambian Emerald (Pear), Natural Cambodian Zircon Flower Pendant with Chain in Platinum Overlay Sterling Silver 5.000 Ct. Silver wt 9.09 Gms. A woman in her life desires to pull off best of lifestyle, particularly contemporary outfits, runway worthy shoes and of course mind fuming jewellery. But the loyalty that she shares for jewellery is just irreplaceable. The same goes for gemstone jewellery especially when it calls for that enchanting green gleam of emerald. Emeralds are widely known as the gem of spring and a perfect choice as it is the birthstone of May. 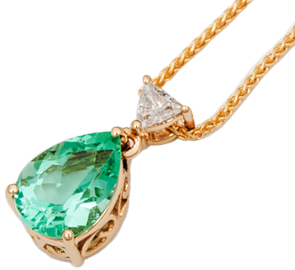 On that note, if you have always been lingering for some real emerald necklace, TJC certainly fits as the right choice having some unique pieces and styles designed exclusively for unleashing elegance. Emerald is a green-hued gemstone that is closer to nature than any other gemstones. Emerald is among one of the most precious gemstones that are not only indispensable for your collection but at the same time add the right bling to your personality. Such is the conspicuous beauty of emeralds that make a place in almost every woman’s jewellery assemblage. Be it an emerald pendant necklace or emerald diamond necklace, the glare of this popular gemstone does the trick to captivate the senses. TJC excels in designing and curating some Emerald jewellery especially the emerald gold necklace with utmost care and precision to bring the most of every piece and make it alluring. From simple to stunning, basic to chic, occasion wear to formal wear, every emerald and diamond necklace is set in silver/gold/platinum or concoction of precious metals to define your ethereal sense of fashion and adds the seamless glitter to your wardrobe. Emerald as a gemstone preludes spring and is a symbol for growth, beginnings and changes. So, trust some inexpensive genuine emerald jewellery from us and make your every occasion just memorable.